So far Microsoft’s Surface tablets have proved to be a huge dud. Consumers across the world have largely yawned or shown the device their collective middle finger. When it comes to tablets and their use on the Internet, consumers have flocked to Apple’s iPad. Even Google’s Android, despite the many vendors supporting the platform, has failed to crack the iPad citadel. But it’s Surface’s dismal failure that has attracted attention since the product comes from the Microsoft stable. Microsoft’s repeated discounts and price cuts have not helped Surface to curry favor with digital media consumers. By our calculation, Microsoft has lost over a billion dollars on its disastrous Surface foray. Microsoft’s mistakes with Surface were several – Late to market, too few apps, lacked the cachet of iPad, not a solid device, and too pricey. A more sensible company would have thrown in the towel. But Microsoft is unwilling to take its lumps and keeps throwing more millions at the tablet business. Microsoft now peddles two tablets, the Surface Pro 3 (12.1-inch display) and the just launched Surface 3 (10.8-inch display). 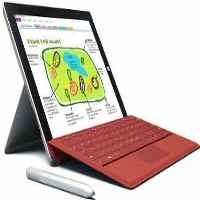 Surface Pro 3 has been available since mid-2014 while Surface 3 went on sale in the US and nine other countries (Australia, Canada, Hong Kong, Korea, Malaysia, New Zealand, Singapore, Taiwan, Thailand) on May 5, 2015. Surface 3 is a scaled down version of the pricey Surface Pro 3 (starts at $930 including the Type Cover keyboard). Now Surface 3 doesn’t come cheap either. Surface 3 (WiFi only, 64GB model) starts at $680 ($500 for the tablet, $130 for the Type Cover and $30 for the pen). If you intend to use Surface as a laptop, then you need the Type Cover. If you ask me, the Surface 3 couldn’t debut at a more inauspicious moment. The tablet market is running out of steam and large screen smartphones (aka phablets) like the iPhone 6 Plus with superior cameras are hogging consumer attention. Tablet shipments in the first quarter of 2015 fell nearly 6% year-over-year to 47.1 million units, according to IDC. Most people (including yours truly) are not replacing their old tablets and new buyers are not entering the market at a pace that will keep the tablet market growing. Even Apple is feeling the tablet pain. In its last financial quarter (fiscal 2Q), the company reported lower iPad unit sales (down 23% year over year to 12.6 million). Surface reviewers still find serious quality issues. Surface’s Atom processor also drew flak from the same reviewer. “Applications don’t load quickly, whether they’re designed for the desktop or touch, and most 3D games on the Store are unplayable due to the Atom’s limited incarnation of Intel HD graphics, which has a lower clock speed and fewer execution units than the versions shipped on Core processors,” the reviewer wrote. More than anything else, there is no compelling feature in either the Surface 3 Pro or the Surface 3 to attract consumer attention to the device. Consumers couldn’t care less about Surface features like one-year subscription to Office 365, a kickstand, 1TB of OneDrive storage or a free upgrade to Windows 10. All they want is a glitch-free tablet that functions fast, smooth and has a gazillion apps. At the end of the first quarter of 2015, Microsoft failed to make it to even the ranks of top five tablet vendors. If Microsoft thinks it will find its pot of tablet gold at the high end, let’s not forget that even if such a market exists it must surely be extremly tiny. If Apple launches its rumored 12.9-inch iPad in the second half of 2015, that will be another nail in the Surface 3 and Surface Pro coffin. After all, Apple has a dedicated fan base for its consumer devices that Microsoft badly lacks in the mobile devices arena. Even as tablet sales are declining, phablets are proving popular with consumers. According to market researcher Kantar, phablets cornered 21% of all US smartphone sales in the first quarter of 2015, a huge jump from their 6% share in the first quarter of 2014. Microsoft refused to disclose Surface unit sales for its fiscal third quarter of 2015 (ended March 31, 2015) but it’s safe to assume the number is still an embarrassment. With no compelling features, a tablet market in decline, lingering quality issues, a steep price and a growing phablet market, both the Surface 3 and Surface Pro 3 are doomed to fail compelling Microsoft to resort to its ritualistic trade-in programs and discounts in a futile bid to get rid of inventory. How large corporations like Microsoft can get away with squandering billions on fanciful schemes like Surface is a mystery wrapped inside an enigma.